What do you do with a typical South Florida home? Mid Century Modern, built in 1968, 1200 square feet? I mean for the holidays. 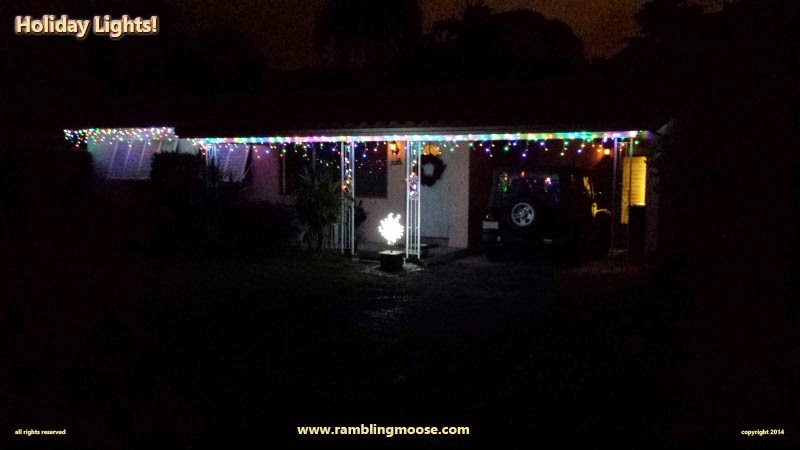 When I think of holiday lights here in South Florida, I think of some of the usual things. Rows of palm trees wrapped with the same color lights to look like the Parthenon columns. If they're done right they look like fireworks. Right up the trunk and out each frond to send lines of light out to the compass points. My palm tree isn't that tall yet. The one that insisted that it gets to grow in my irrigation line got too big to stay there, so I moved it out front and planted it in the island. The Bottlebrush tree that I keep expecting to die hasn't given up the ghost and I refuse to kill a tree. Maybe next year. But we did what everyone else did here, trace out the line of the house in color changing LEDs, hang icicles, and call it done. There are thousands of these houses in South Florida, and in December, many of them look just like ours. The funny thing is that I didn't expect us to go through what we did to get the silly icicles in the first place. Our original lights were subtle. They would color shift through the spectrum and lined the roof line of the house. But since we were in a mall up in Pompano Beach, I was shopping. I ended up in a discount store and spotted their holiday lights display. They were just put out at that moment so I texted Kevin and asked him if he wanted to look. He found four boxes of these things and called it done. It wasn't. We got the lights up and needed at least one more set. Going back to that store was fruitless. They had been sold out. Cue one of those mad dashes all over the county looking for more of those stores and more of those lights. At the third one of the chain he got bold. Asked the person there if there were more and got the standard "Only What's Out There". That doesn't work with us, we had him go into the back. When he was gone, Kevin spotted more of them just out of reach. Once that person got the ladder, Kevin had the last two boxes. So we're set for next year when we end up not being able to find a string of the silly things. Much better than driving all the way down to a questionable part of Hollywood, FL, looking for cheesy LEDs in a discount store! That white burning bush out front has it's own story. The Gables has a large apartment complex here called Gables Wilton Park. It's here for the long haul, well built and sturdy, it looks like it will outlast most of the people I know. They put up a lot of LED lights over the years and decided to put up something that I found rather nice. It's an artificial tree that has a white LED in a flower on the end of each twig. Being white LEDs, it puts out a lot of light on their property and it actually looks pretty realistic. The flowers remind me of the Crabapple and Cherry Blossoms that were growing all over the place in Cherry Hill when I was a wee brat. We looked into it and found that they have a "shrub sized" tree. Got two of them, sunk them in a concrete planter, and wired the one up in the little rock garden by the front door. Ooooh, Glowy! The thing actually lights the house up by itself, and only uses about 2 watts of power at mains voltage. Great for security. When the holidays are over, that will remain there lighting the path and the carport for years. I'm glad we looked into it. We still don't have a clue what to do with the second one, but I think it will probably go out back for lighting near the pool. Maybe down at the deep end near the Utility Easement. After all, isn't that what everyone needs in South Florida? A Burning Bush by the Pool to scare off the predators?